At first glance, you might think the little coyote in this video has flipped out, but keep watching: she’s found a bouquet of balloons that were left overnight and is having a ball testing them and making them bounce around. She zooms past them quickly because she’s not quite sure what they are capable of. As she does so, she prods, taps and tests to find out. Contrary to what some folks think, coyotes are drawn to novel objects, not driven away by them! Coyotes are innately curious, inquisitive and nosy: they have a need to know. So they are compelled to investigate, to test new objects: it’s a survival skill. Place any novel object, including unpredictably bouncing balloons in a field, and although their initial reaction to most new things might be to stand back and watch, soon, sometimes over the period of several days, but sometimes right off, they begin to investigate, gingerly moving in closer and closer until they can touch it ever so quickly and then jump back or withdraw their paw — just in case it bites — little by little examining and testing its reactions/responses. Coyotes test an object’s danger and limitations in order to allay their fears. This may be one of several reasons they approach some dogs: they are investigating what a particular dog’s reactions might be to them and if the dog’s intentions might be harmful. How to handle this? Keep your distance always. The minute you see a coyote, especially if you have a dog with you, shorten your leash and walk away. Carl Safina is one of my great heroes, as he is many other people’s. All my views about sentient wildlife, examples of which I see daily as I watch my coyotes, are confirmed by Carl. When he speaks, I feel as though he is taking the words right out of my mouth — every single word and thought about animals as feeling and thinking critters. The difference is that he is an academic, and to have an academic stand up for these things is an important turn of events, though late in the coming. Academics have long separated humans absolutely from all other species and they don’t tolerate anthropomorphizing which they consider unsupportable and therefore fanciful. In fact, accurate anthropomorphizing is no longer thought of as unsupportable: it’s the path that behavioral research is now taking. I see a lot of coyote behavior for many hours each day. I have spoken a lot about coyote feelings and their intense family lives — lives which really are not so different from our own in a great many respects. I’ve had some academics pooh-pooh what I say. But Carl, as Jane Goodall, who has actually spent time watching the animals as I have, supports these same ideas. Theories and studies of focused slices of animal behavior do not cover the same ground as being in the field watching the whole picture: an animal going about its life. It’s because an animal feels hungry that he eats, feels tired that he sleeps, feels joy that he plays, feels affection that he caresses another. It’s what they feel that actually drives their lives. Above that, their amazing family ties and lives are a wonder to watch: a microcosm of your favorite soap opera, with a cliff-hanger every day! Carl says that our need to see ourselves as above anything else speaks volumes about our insecurities. In fact, what makes humans different is that we do things to the extreme, which animals don’t do: We are, at the same time, the most compassionate and the cruelest of the species; the most creative and the most destructive of them. This is what makes us human. Having emotions and emotional bonds are not what distinguishes us as human. Please make sure to check out Carl’s recent book, which now can be obtained in paperback: Beyond Words: What Animals Think and Feel. I took notes at Carl’s talk, but rather than present them here, I’m linking to a video of the exact same lecture given by him elsewhere: straight from the horse’s mouth. Summary: I describe a beating and associated behaviors that appear to be leading to dispersal, and I speculate about the role of hormones in this process. The next thing I know, Mom walks over to Yearling Daughter who, upon seeing her mother coming towards her, crouches low and remains motionless with a fearful expression on her face. Mom walks stiffly and stands over Daughter threateningly, with hackles up, stiff and erect tail, teeth bared, lips curled back, and narrow-slit eyes. With only minor repositioning of themselves, they remain this way for over a minute, though it seems like forever. During a millisecond of Mom’s inattention — though Mom may have allowed this — Daughter slithers out from under Mom, crouching low and keeping her rear-end tucked in. Looking at these photos later, I could see that before I had arrived in the park, there had been a battle: Daughter had a bleeding mouth and a bleeding tear under her chin. Not only is Mom beating up on Daughter, brutally shoving her with the side of her body, hovering over her, punching and biting her, but her 6 month old son — normally a buddy of Daughter’s — has followed Mom’s lead and is doing the same thing, just as fiercely. The scene is intense. As seen in the video, finally Daughter extracts herself and runs off, but Mom races after her and slams her down one more time, in a way that suggests, “You better just watch yourself”. Daughter sits still, appearing to shrink into herself for protection and maybe to make herself look smaller, and finally she is left alone. She then runs off, distancing herself from her mother and lies down to rest. Now I’m able to see her numerous fresh wounds, and I can see that she’s utterly dejected. She puts her head down and closes her eyes several times. Meanwhile, Mom heads back to sniff the areas where the altercation took place, and then walks intimidatingly past the daughter who remains prone and still, hugging the ground, so as not to further raise her mother’s ire. 6-month-old pup keeps his distance from both coyotes. Sirens sound again, and this time Mom and 6-month old pup hop up and howl, but the normally spirited little Yearling Daughter does not join in at all. I don’t know if this was of her own accord, or if she had been *told* not to participate. After a time, Mom and son head off on their evening trek. Daughter watches them go and remains where she is as the two of them disappear into the distance. She then gets up and goes the other way, limping, and ends up in some tall grasses, where her yearling twin brother comes by and touch noses with her. The 6 month old pup reappears and, true to form, follows the older brother’s lead in touching noses with her. Is the 6-month old simply conforming to the behavior of his elders? Coyote yearlings are maturing into adults with increasingly independent drives which appear to be upsetting the established social order in their families. Coyotes live in highly structured families on exclusive family-owned territories. They have a rigid hierarchy for maintaining social order and for maintaining territories with low population densities. Here are some of my additional observations of behaviors that appear to be associated with the beatings, along with some of my speculations. 1. Yearling Daughter appears to have become too independent and too much of a leader. She has been out in the forefront often, leading the others. For instance, it’s this daughter who has figured out where scraps of food can be found, and she always gets there first and eats first, and she’s the one who leads the others there. Could this type of upstart leadership be a threat to Mom, and might Mom sense this as a threat to the whole family? Aside from the leadership question, might Mom consider that particular location dangerous (having dangerous dogs or people) and therefore warrant putting an end to going there? One of the recent *beatings* took place at this location. The result: Daughter does not venture over there anymore. 2. Youngsters are disciplined in order to maintain social order. The discipline is often severe: tough action speaks louder than tough words! In the video, Mom’s harsh lashings could be aimed at squelching an intensifying hierarchy dispute between the stronger yearling and her 6-month old sibling. Younger son’s participation may simply be *getting back at* his sister for previous incidents against him. However, the picture actually looks much bigger than this one incident. 3. Deference towards Mom by Daughter has been sliding recently. Kowtowing and submission is now being forced by Mom instead of being a willing component of the daughter’s behavior. Interestingly, mom no longer grooms Daughter, even as she continues to groom all her other offspring, be they yearlings or this year’s pups. Is the mother distancing herself from this offspring? Mom’s “beatings” as seen in the video have served to demote the female to lowest man on the totem pole — even below the much younger 6-month old son. Ever after I took the above video, Mom, if she’s there, puts Daughter down for pulling rank on ANY of the other family members. The 6-month old pup has taken advantage of the situation to actually prod and poke his sister — literally. The 6-month old pup isn’t smart enough or strong enough to dominate his sister yet, but with Mom’s presence preventing Daughter’s reaction to the prods, he seems to have climbed above her in rank. So, Mom has knocked the female yearling down a few notches in her relationship to all others. 6-month-old brother, in the middle, has just prodded his yearling sister by poking her with his paw. 4. And, ever since the beating in the video, Daughter takes off running whenever she sees Mom coming from the distance, and most of the time sits on a little knoll far from the rest of the family when the rest of them congregate. Mom’s (and 6-month-old son’s) persistent antagonism is leading to Daughter’s increased isolation and exclusion from family events, though she still joins when Dad around. 5. The hierarchy issue appears big, but the ultimate result might be dispersal of the yearling, unless things change. Driving youngsters out is called dispersion, and it’s necessary, not only to keep the population numbers low enough to insure there are enough resources (resources are always scarce) for everyone who remains in the territory, but also to insure the smooth functioning of the family unit. There is no room for upstarts or two alphas. 6. Reproductive competition may be one of the biggest factors in the beatings and then dispersal. I’ve seen this same antagonistic behavior in another family between a mom and her daughter, and in a family between the father and his son. In all cases, the *upstart* yearlings were demoted to the very bottom of the established family hierarchy. I’ve observed that it’s mostly the mothers who drive the female yearlings out, and the fathers who drive out the males, though I remember seeing one father drive a daughter out. It makes sense: the dads do not want reproductive competition from a son, and the females do not want reproductive competition from a daughter. 7. SPECULATION ABOUT THE ROLE OF HORMONES: It has occurred to me that the *beatings* and *intimidations* may go on for another reason which falls short of actual expulsion of the youngster female from the family. We’ve all heard that, in any coyote family, only the *alphas* reproduce, yet yearlings often are allowed to stay in the family. Why don’t they reproduce? The *reign of terror* as you can see from the above video, is pretty strong. Although this would have to be explored by an endocrinologist, I do know that fear causes cortisol to rise in animals, and heightened cortisol, in turn, inhibits the production of reproductive hormones. Could this be causing the beta adult females in any family to become temporarily sterile? In this case, the *reign of terror* by the mother would be geared to insure that only she, the mother, the alpha female, will be reproducing within that family. Food for thought. 8. FURTHER SPECULATION: Could Mom’s behavior be triggered by her sensing a competitive hormonal state in her daughter? I’m throwing this out there as a possibility because, in this and in another family where I observed the same beatings, the mom was particularly interested in smelling the reproductive areas of her female daughter. It would be interesting to investigate this if it hasn’t already been. If it is possible for menstrual cycles to align themselves when all-females cohabitate (all-girl dorms and nuns), it might not be so far-fetched to think that some form of hormonal communication could be occurring between female coyotes, and could be a factor in adult beta females remaining *behaviorally sterile* within coyote families. For instance, could one female’s strong hormones act to inhibit those of another proximate female? An alpha with strong hormones would be able to retain the status quo, but what might happen if a youngster’s hormone levels surged in response to Mom’s weakening hormone production as she ages? Would a mother’s *reign of terror* raise cortisol enough to scare a youngster’s endocrine system from producing? There’s one more interesting factor here associated with hormones, I think. Females go into estrus and reproduce only once a year. The odd thing is that males, too, only produce sperm — spermatogenesis — at that one time of year. What triggers their overlapping schedules? More food for thought. 9. 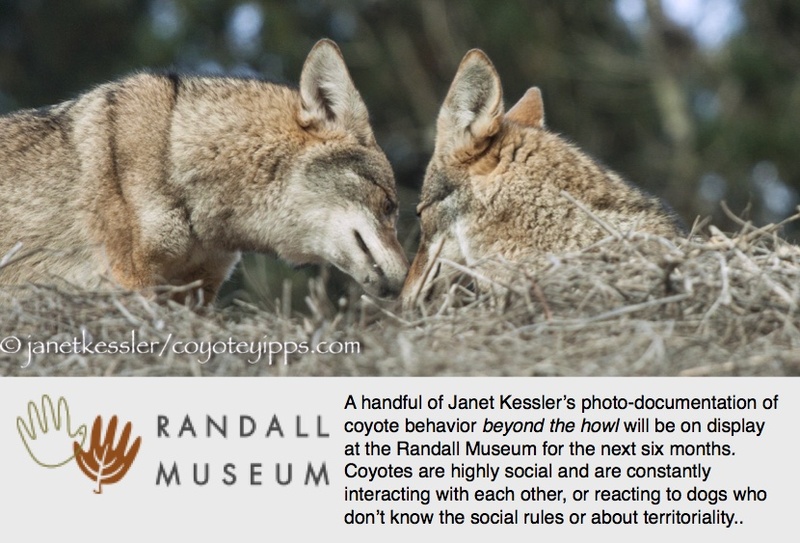 For the purpose of this posting, I’m not going to get into the different personalities and histories of each coyote in the family except to mention that *Dad* in this family has a fondness for all his pups and indulges each and every one of them: he grooms them, nuzzles them and shows them affection. The same affection is not conferred on Mom — he appears to have chilled towards his mate who he sometimes prevents from grooming him and who he never grooms: her advances for purposes of grooming/affection and even rank confirmation/testing seem to be rejected. In addition there frequently are growls and teeth baring between these two, including at his initial interactions with the yearling daughter. Simultaneously, Dad seems to soothe and comfort Yearling Daughter after Mom’s attacks sometimes. Might all of these little behaviors cause Mom to feel competition from Daughter? It seems to me that this could be a contributing factor in the alpha female’s need to drive Daughter to the lowest rungs of the group and maybe off. 10. The phenomenon of territoriality keeps the population density down. The territory in the case of this family is a golf course. You might think that golf-courses are large enough to be home to many coyotes and that they are ideal habitat, but they are not. In this particular golf course in the past, there was desperate internecine warfare between two coyote families. I’m told that the puppies of one family were killed off: this shows how severe the battles can be. There is room for only one family and the other family was forced to leave. Golf courses are kept for golfers, not for coyotes, so overgrown foliage areas where rodents might live are cleared out regularly. The lawn/turf areas are not much better than plastic astroturf or concrete in terms of the foods they supply: they are cleared of gophers on a regular basis with one-way traps which break the gophers’ necks: not a pleasant death, but the point is that gophers are eliminated, and gophers happen to be one of the coyote’s staple foods here in San Francisco. So a golf-course serves mostly as a home base, not as a food gathering area. Coyotes trek further afield for most of their sustenance, into neighborhoods and other open spaces and parks. Coyotes actually trek further than their claimed territories, be they parks, golf-courses, or open spaces, no matter how dense the resources are. I’m simply suggesting that golf-courses are not sustainable food areas for coyotes. Territories (home bases) and surrounding ranging lands only support so many coyotes: the population is kept low through the phenomenon of territoriality, as far as I’ve seen. In any one territory, grown coyote pups eventually disperse, or leave the territory between the age of one and two years usually, and those that don’t leave are betas who do not reproduce. Dispersal is necessary to keep the population numbers low enough to insure there are enough resources for everyone who remains. 12. What’s fascinating about this video is that the 6 month old pup has joined his mother in beating up his elder yearling sister just as vehemently as is the mother is. He’s always been a buddy to his older sister, following her, copying her, the two of them grooming each other, and she coming to his rescue/defense whenever she felt he was in danger. Now, suddenly, he has taken on his mother’s behavior and ganged up on his older sister. His survival, of course, depends on his aligning himself with Mom. And it is through copying that coyote pups learn. So, the sister gets beaten up. The sister is clearly traumatized both physically (see wounds I’ve circled in the photo), and emotionally. Puppy also suffered collateral damage, but only physically. 11. After the beating, the Yearling Daughter wanders off to be far away and acts dejected. Do coyotes have feelings? I myself have no doubt. You can figure out how they feel by the way you might feel under certain similar circumstances (see some of Carl Safina’s videos). This is not anthropomorphizing in the sense that purely human characteristics are placed on animals. These animals actually have these feelings which are best described by the language we use to describe our own emotions. However, it is anthropocentric for humans to believe that they are the only ones who feel things. Finding similarities is what helps people relate to wildlife — we need more of it, and less of a divide than what some academics have clung to. The new models are Jane Goodall’s and Carl Safina’s. More and more scientists are seeing animals as sentient beings who share many of our own, or very similar to our own, feelings and emotions. The young female coyote has gone off to be alone, far away from further parental and sibling torment. The normally perky and energetic youngster here puts her head down, as though defeated. She stays off to herself. She doesn’t joint the next howling session. She doesn’t join the family for their rendezvous and trekking session. In fact, she trots in the opposite direction: she’s been excluded from participation in the family — shunned. Remember that family life is what they live for. So she can’t join the fun and games: you can tell she wants to by the way she lurches forward just a little sometimes and then restrains herself. She behaves exactly like my dog when he’s been told to sit/stay, yet he wants to join the rest of us. As I left the park this day, I heard loud squawking and branches rustling strongly in the branches way above. I looked up to see a red-shouldered hawk fighting with another red-shouldered hawk, and I wondered if dispersal was in the air. Nature is not always as kind or sweet as many of us might want to believe: it has its heartaches as well as its joys. Coyote fathers are totally involved in the raising of their youngsters. Here, Dad and five-month-old son spend a few moments watching the goings-on around them before Dad then grooms the pup — probably removing ticks — and then son prods Dad for some food, unsuccessfully. The coyote takes off — didn’t want to mess with a kitty. BUT. . . maybe the kitty might like to play? The coyote runs for her life. Finley, the little kitty who scared away a coyote. The coyote decided it was safer to chase cars! This photo was taken right after the coyote ran away from Finley. Sadly, it was Finley who was killed by a car two weeks after these photos were taken. Addendum: This posting should be a lesson to everyone that cats are not safe unattended out-of-doors. This story has an unexpected twist which is amusing because it is unexpected. Small pets will inevitably encounter other animals, be they coyotes, raccoons or dogs, all of whom have their own agendas which you cannot predict, and they will encounter other dangers, such as traffic which could threaten a pet’s life. Please keep your cats indoors and only let them out if you can supervise them. Two days ago I saw a very healthy-looking coyote, photo attached. It got a laughing gull off the shore and took it presumably to a den, then returned for more. My two friends were freaked out, although the animal was quite far away from us and wouldn’t have approached us, I’m sure, since it looked very capable and healthy. But we did tell a group of women coming to the beach with a toddler in a carriage and a lab whom they wanted to let loose to swim in the ocean that they should not let the dog or the kid run around too far. They too freaked out. I’m not sure I’d want a coyote too close to our fenced-in yard where Haggis runs around, but he’s never unsupervised. In the video, after sirens sounded, first there was a howling session, then some greeting and hierarchy interactions which included nose touches, dominance displays, body contact, submissive displays and confirmations. And then this! Pestering? Teasing? Demand for attention? Challenging? Provoking??? Or maybe he’s just simply not doing what she wants him to do? The two coyotes *of interest* are an older mated pair with a family of yearlings and pups. I’ve seen an established routine of antagonism between the two whereby the female snarls, and grunts at *him* and he simply ignores her or turns away after, often, responding with a snarly grimace. She continues to groom him sometimes, but also they tend to walk right past each other as ships in the night without acknowledging the other’s presence. The male is a rather easy going fellow. The female appears to be older than he is — she’s the one doing the prodding. The territory is one in which the male was born and the female then joined him and they’ve been together ever since. I know another mated pair where there seems to be more antagonism as the pair has aged. The male is much older than the female: he is 8.5 years old and she is 4.5 years old. They’ve raised two pups over the course of three seasons who they keep well hidden. Their relationship began with the male being very solicitous and careful. More recently, and maybe it’s because he’s quite old and in pain, I’ve seen him become grouchy on occasions, even throwing *her* to the ground when she pinches him by mistake while grooming him. She ducks or falls on her back, and then, when his anger is over, she continues grooming him because he apparently demands it by standing next to her: her job is a chore now though it didn’t used to appear that way.